Note: Please make sure you have booked your activities; tour; packages first before make any payment to us. We do not accept any payment without booking confirmation. BOOK NOW! When you make payments to OXBOLD Sports Sdn Bhd, you agree to these Payments Terms. When you confirm a transaction with OXBOLD Sports Sdn Bhd, you agree to be bound by and pay for that transaction. Pay attention to the details of the transaction, because your total price may include taxes, fees, and shipping costs, which you are responsible to pay. Don't commit to a transaction unless you are ready to pay, because all sales are final. Please make sure you have booked your activities, tours &/or packages before make any payment to us. We do not accept any payment made without booking confirmation. If you order something that becomes unavailable before it can be provided to you, you are entitle to receive a refund of your purchase price. You may be presented with additional terms related to a specific purchase before you confirm the transaction (such as shipping terms for tangible goods). Those additional terms will also govern that transaction. Even though we use terms like purchase, buy, sell, and order to talk about transactions related to Credits, you don't receive an ownership interest in those items. WE MAKE NO WARRANTIES OF ANY KIND, EXPRESS OR IMPLIED, WITH RESPECT TO ANY PRODUCTS OR SERVICES SOLD ON OR THROUGH OXBOLD SPORTS SDN BHD, UNLESS STATED SPECIFICALLY. We want to make payment process convenient, so we allow you to make payments using a number of different payment sources, like Interbank Transfer, Telegraphic Transfer (TT), Cash, ATM Deposit, PayPal for credit cards and debit cards. We will provide you our company bank account details from your booking form. 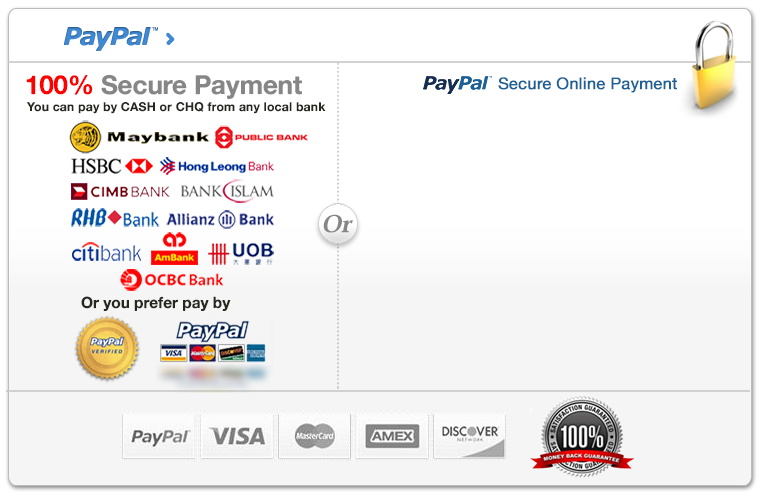 You can bank-in direct to our company account at Maybank and EMAIL us the bank-in-slip for proof of payment. Please bear in mind that all TT charges are to be borne by the customer. There would be no refunds for cancellation after the activities/tour &/or packages has commenced or for any activities/tour &/or packages, transfer, accommodation, meals or any other services provided not utilised. Any refunds will not cover foreign exchange rate differences, bank charges for refund and the handling charge incurred. OXBOLD Sports Sdn Bhd (www.oxbold.com) merely acts as a platform for products and services of the suppliers and shall not be responsible nor liable for Overbooking, misinformation or mishandling of any reservation or booking by the suppliers, any other dissatisfaction or complaint of the member relating to the quality of the products or services provided by the supplier or otherwise howsoever, any damage or loss to your personal property or personal injury howsoever sustained or caused. In the event of mishandling, misinformation or overbooking by a supplier, or any other dissatisfaction or complaint aforesaid, the member should take up the matter directly with the supplier who is under an obligation to deal with such matters in accordance. OXBOLD Sports Sdn Bhd will provide Insurance as an optional purchase to our customers. Please inform us if you required Insurance for your activities/tour &/or packages. You may read our Insurance Coverage Benefits at the Add On Services page. It is your responsibility to obtain a visa (where required). Please ensure you have a valid passport for the duration of your activities/tour/packages. We need your Passport number and other vital information for your activities/tour &/or packages booking and Insurance purchase. OXBOLD Sports Sdn Bhd (www.oxbold.com) nor the supplier shall be liable for damages of any kind arising out of changes to the rates, route, timetable, itinerary in respect of the product or service due to unforeseen circumstances or circumstances beyond our control. The company shall be exempted from liability for loss, injury or damage to property or personal accidents, delays irregularities or the occurrence beyond our control. Note: the number of days will be difference depend on activities; please check the Cancellations policy of each sports/activities you are signing up! • No show or UN-USED Service, 100% of payment made will be forfeited. Some supplier/operators and management require 100% non-refundable cancellation and some impose no-cancellation policy upon booking during weekend or peak seasons. Please check with us prior to booking if you are not absolutely sure of your travel plans. It is possible that due to inclement weather or any other unforeseen circumstances that itinerary or routings could be changed. The company will substitute arrangements of the similar standard, or reschedule to a later date and agreed by both parties, should it occur. However no refunds will be available. Unless customers have a valid reason of not able to continue the activities, then refund will be made. Excess baggage charges, personal and baggage insurance, beverages, gratuities to drivers and escorts and all other items of a personal nature; and optional tours, tips for drivers and guides (at your discretion), admission fees are excluded unless otherwise stated. PayPal Sale Tax will be included in PayPal payment. Please send us an email (info@oxbold.com) to notify your PayPal payment to double secure your booking. This is a beginner windsurfing lesson. Ideal for fresh and beginner who want a hand-on experience to learn the sport together with friends. RM50 Surcharge apply to each person who sign up the lesson less than 3 (three) days before the activity date.